Sonic brings a state/county fair favorite to the menu with the launch of new deep-fried Oreo cookies that they're calling "Oreo A La Mode" because they're served with a side of ice cream. They've also brought back Cinnasnacks as "new" Cinnabon Cinnasnacks A La Mode. 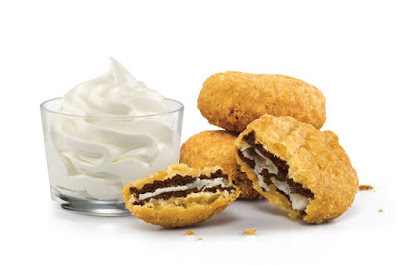 Oreo A La Mode features battered and deep-fried original Oreo cookie sandwiches that you can dip in the accompanying side of soft serve vanilla ice cream. Cinnabon Cinnasnacks A La Mode consists of warm, flaky pastries with cinnamon roll filling inside served with a side of vanilla soft serve ice cream. Both desserts are available for a limited time at participating Sonic restaurants at $2.99 (may vary) per order.